WCIT-12 may have ended, but now begins the work of analysing how the ITR changes will have an effect on international telecommunications. 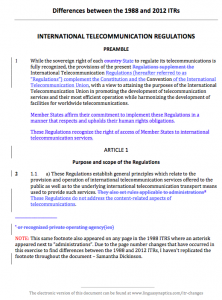 To help those wishing to do that analysis, below is a PDF that shows exactly what has changed, in the English versions, between the 1988 text and 2012 text of the International Telecommunication Regulations. 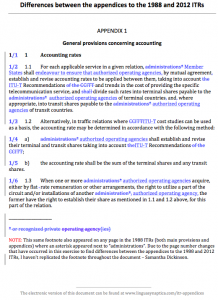 Article 7, Suspension of services, is the least-changed of all the provisions in the ITRs. All other provisions have a significant number of text changes. 17 December 2012 update: In tidying up the slightly weird way Word had performed the “compare documents” function, I inadvertently included some text twice in deleted item 45, section 6.1.3. The PDF linked below contains the updated, amended version. There seems to be a bit of confusion about how the Internet-related resolution, “To foster an enabling environment for the greater growth of the Internet”, in DT/51 rev. 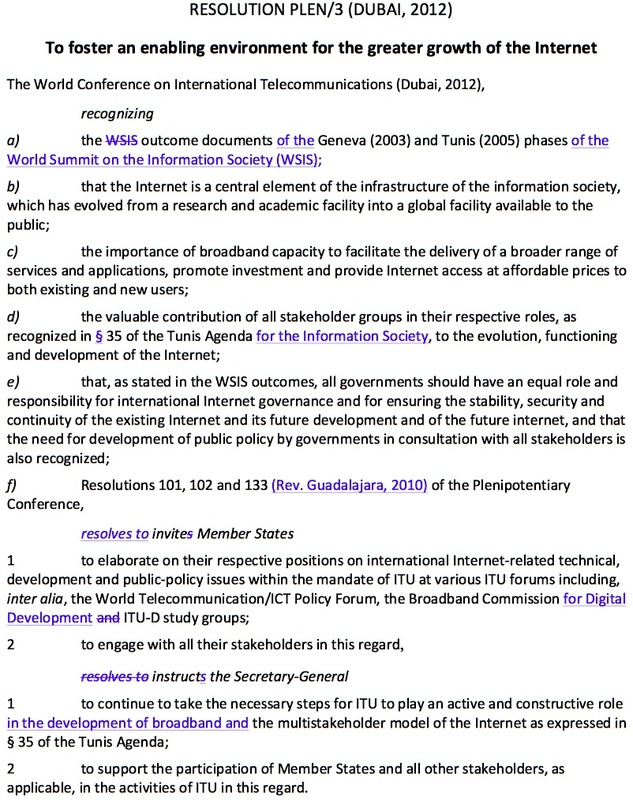 1 (page 22), at WCIT-12 was just adopted in the plenary. Unfortunately, the official ITU .docx transcript of the latest WCIT-12 plenary that ended at 1:30 am will probably take a few hours to be published.